When you become a new parent for the first time, it doesn’t take long to realize kids are little sponges. They soak up everything around them because it’s all new, and they catch onto more than you think. I don’t know how many times I’ve been talking to someone about something that I think is over my 4-year-old daughter’s head, and the next thing I know, she’s asking me detailed questions about it. I have to watch myself and everything I say, but one thing I don’t want to hold back on is talking about our family finances and money in general. When I was little, I remember hearing my parents discuss budgeting and saving money on a regular basis. I never heard them fight about it or have major problems, but they were very open about the fact our family was on a budget and trying to prepare for the future. The worst thing I can remember is when my father’s factory went on a strike, and we had to go without his paycheck for a few weeks. We were okay, but I remember his concern and how we didn’t spend very much money that month. I realized money was a little tighter for a while, and in no time, we were back on track because my parents were avid budgeters. While you don’t want to alarm your child if a bad financial situation comes along, it’s important to show kids of all ages how your family manages their household money, and how you can discuss it openly and in a responsible way. After all, they’re going to learn from your example. It’s never too early to start teaching them about it. 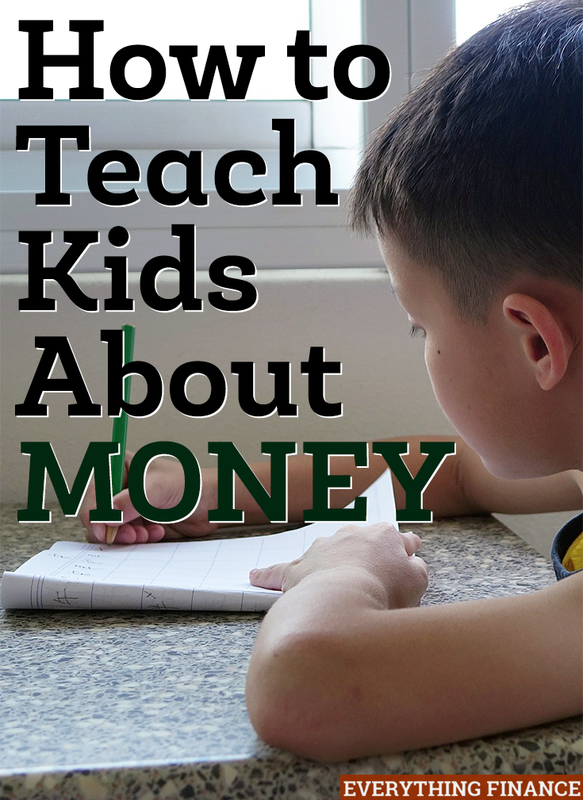 Here are some simple ideas on how to teach kids about money no matter what age they are. Once your toddler or preschooler begins to learn numbers and counting, give them a clear piggy bank of their very own. I gave my daughter a clear plastic one so she can see the money as it adds up, and she loves to take the money in and out of it. I also gave her an old wallet of mine to play with as well. Sort through the coins and dollar bills, and have your child put like objects together. You can stack 5 or 10 pennies to visually show them how many make a nickel or dime, and so on. Discuss how each coin and bill is worth different amounts, and then role play with them. My daughter and I love to play banker/customer and shopper/cashier. We “shop” for items in her room, and we go to the “bank” to deposit money into our savings account. It sounds simple, and it is, but your child will love playing this game over and over again. Elementary age is a great time to start teaching kids about how much things at the store cost. If your child receives money as gifts for a birthday or Christmas, give them a wallet to hold it in and ask them what they’d like to do with it. Be open to whatever they come up with, and then offer suggestions from there. Suggestions could be to spend some, save some, and give some away, and the popular thing to do today is to use three separate mason jars for this task. Mark one as save, one as spend, and one as give, and let them choose how they want to spend their money. If you’re open to the idea of paying a little money for some chores, go ahead and start now. It doesn’t have to be much, and it doesn’t have to be done for every chore, but I don’t think there’s anything wrong with rewarding for chores. Why not work a mini financial lesson into your child’s mandatory chores? If they want a new toy, let them pay for it with their own money so they realize how much money it actually costs. It may only take one or two toy purchases before they realize they do want to save some more money, and it’s also a good time to introduce tithing if that’s something that’s important to you. Preteens are at the age where they want everything. This is an understandable feeling when all of their friends seem to have the latest gaming consoles, motorized toys, and iPods (or other tech gadgets). They also want to go see friends at the mall, hang out at the movies, and go out to eat. They always seem to need money, and it’s hard to say no when they just want to fit in with their friends. We’ve all been there, right? Don’t always be an open wallet during this time. Start a bank account for them (if they don’t already have one), and let them manage their own allowance, if they get one. It’s a great introduction into basic budgeting, and once their fun money is gone for the month, then it’s gone. Once that happens, you can help them find ways to have fun with their friends with activities that are free. By giving them a little bit of control of their own money, they have to deal with the repercussions if they spend it all too quickly. Once your child is old enough, consider encouraging them to get a part-time job after school or during the summer. It’s the best way to teach them how long it takes to earn money, and how quickly it can be spent. Blowing your first paycheck from your very first job as a teenager is a rite of passage. It takes quite a while to earn a sizable paycheck at a minimum wage job, especially once you realize how much of it Uncle Sam takes away. Once that check is in hand, it’s spent pretty quickly until there’s nothing left to show of it. I did it and you probably did, too. Let them make this mistake. It’s better for them to learn it now than later, and afterwards, you can be there to offer the tools to help them learn to budget wisely and save for the future. College is a time for trial and error for many young adults. It’s the first time feeling like you’re independent, even if that’s not exactly the case. Unfortunately, many new college students get sucked into credit card debt in a hurry thanks to their new-found freedom and the easy availability of credit cards. Although living on ramen and Spaghettios as a broke college student is yet another rite of passage, college is a great time to start a first real budget, especially if your student is working while attending school. The most important thing you can do when your child finishes college is to drill it into their heads to start saving for retirement at the earliest possible time after graduation. The first adult job they get is the perfect opportunity, and college aged kids have time on their side. If you can drive that point home early on, they can be sitting pretty later on in life thanks to your expert guidance. Whatever you do, as your child’s most visible example, make sure to be a good steward of your money. They learn from you from age 0 all the way to age 18 and beyond. Their financial behaviors in the future will likely model yours, so if you’re bad with your money, then it’s likely they’ll hit some financial stumbling blocks in adulthood as well. Try to be their best example. How did you learn about money? Were your parents open about money in your house growing up? Do you give your children an allowance?